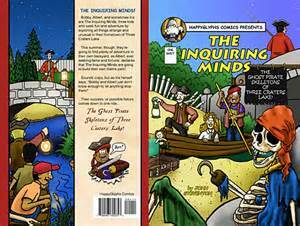 Review: The Inquiring Minds: The Ghost Pirate Skeletons of Three Craters Lake! The Inquiring Minds: The Ghost Pirate Skeletons of Three Craters Lake! Is another comic I picked up at SPACE this year. It is by John Steventon and tells a story about a group of kids who call themselves “The Inquiring Minds”. The Inquiring Minds consist of Albert, Bobby, and Iris (who officially becomes the third member during the story.) The “Ghost Pirate Skeletons of Three Craters Lake” is a theme park the boys decide to create in their back yard as something really big and completely over the top to do during their summer vacation. The kids are quite resourceful and funny throughout the story. 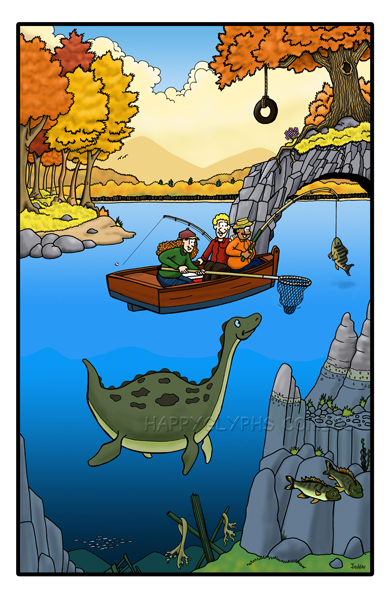 The art is comical and does a great job clearly telling the story. And the kids’ characterizations are absolutely wonderful! This comic is one of those that kids will love for all the zany antics and because the main characters are kids who accomplish great things. But also, this comic is a great example of a story that doesn’t just appeal to kids. I found the comic funny and I was eagerly turning the pages to find out what they would all do next. I think this comic would appeal to anyone who has ever been a kid. (Which would be lots and lots of people.) Especially if you ever dreamy big when you were young. Some particular things I likes about John’s storytelling were how he occasionally broke with the typical comic format for a page here and there and the art-within-the-story, including the lego set. My favorite scene was when Iris becomes an official member of the group. “Hold on guys! I made a cake…” was my favorite line. You can check out some of John’s work and order comics such as The Inquiring Minds: The Ghost Pirate Skeletons of Three Craters Lake! here. And check out the John’s blog here. 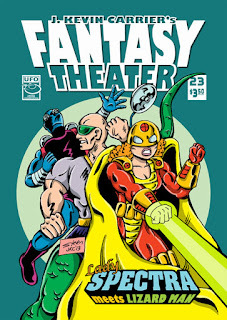 J. Kevin Carrier’s Fantasy Theater #23 is now available in both print and digital formats. This issue marks my first collaboration with Kevin in the story that leads off the issue: “The Godmother Principle”. The creation of this story was great fun for me and I’d like to share some details, as well as I can remember them, here. I think I had considered trying to do a story with Kevin’s Lady Spectra character for quite some time. I really like the character. She’s a strong, smart, powerful woman and the elder half of a mother/daughter super-hero team. That’s a very original idea, and I enjoy all of Kevin’s Lady Spectra stories. I had mentally decided once that Lizard Man would be the character I’ve created that would work best in some kind of cross-creator team-up story. He’s a light-hearted character who isn’t in the deep stories from some of the F.E.D.s storylines, and he’s visually fun. So anyway, I pitched the idea several years ago when I saw Kevin at SPACE that we should team the two characters up. He said it sounded like a fun idea. Then I spent a year wondering what to do with such a story. Finally, I had a way to get them together, so when I saw Kevin again I proposed a Marvel-style collaboration. I would come up with a plot and draw the story, providing Kevin with some notes as to the plot. Then Kevin would write a script, ignoring my notes as much as he wished, and letter the story. Since writing is my least favorite part of the creative process, I enjoyed this method of collaboration a lot. 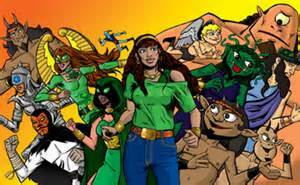 The Green Gorgon #1 is Mike Indovina’s follow up to his award winning webcomic Timeless. (Since Timeless is free on the web, you could also read it now and not have any of the following reveal any major spoilers.) Timeless is the story of a woman named Pyrrha Stavros, who discovered she’s an immortal being who does not just live in the present day, but can travel backwards and forwards in time, taking on the personas of past lives she had lived. 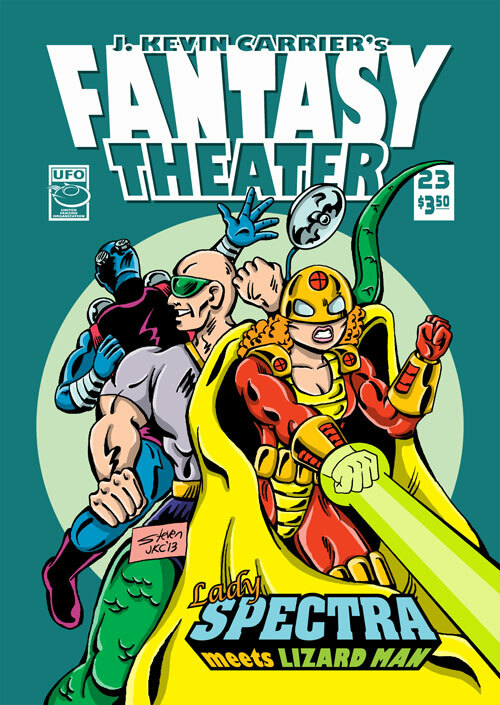 She mostly deals with the ancient Greek and Silenus the Satyr, the 1980’s when she was a High School student, and the 1940’s when she was a masked crime-fighter called…the Green Gorgon! Mike art in The Green Gorgon is a bit sketchier than in Timeless, and the printed book does not have the color that is present in the webcomic. However, he still has a charming cartoony style that shifts somewhat, while still staying recognizable, as Pyrrha shifts through different time eras. The Green Gorgon costume and the design of the armored villain are particularly nice, also. The story in The Green Gorgon does a lot of time-jumping and does it well. I must admit time-travel stories are not something I normally enjoy, due to them usually using time travel as a cure-all to whatever problems arise in the story. Mike avoids this aspect by explaining how the immortal characters exist in a way that they are moving through time like a reader can flip the pages in a comic forward and backward. Also, he uses the example of a movie filmed out of sequence as a way to explain how the time travel in Green Gorgon works. I like this explanation, and it added to my enjoyment of the story. Mike also does a very good job writing dialogue for his characters, and making that dialogue fit the era’s cultures of the characters. I especially like his writing with Silenus the Satyr, but he doesn’t make an appearance in this book. I’ve enjoyed all of Mike’s work I’ve read so far. I yearn for more! Check out his website to read some stuff and make some purchases! 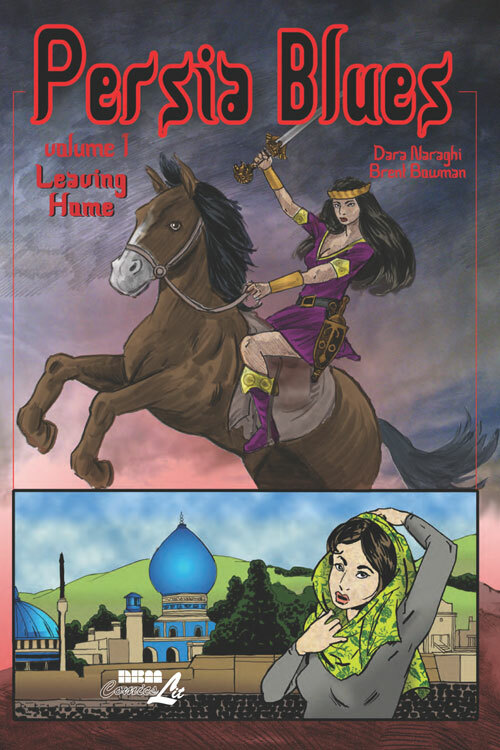 Persia Blues is written by Dara Naraghi and drawn by Brent Bowman. It is another comic I picked up at SPACE this year. The specific comic I have is the “Special Preview”. Persia Blues is the story of Minoo Shirazi, who is a rebellious young woman in modern Iran. But it is also the story if Minoo Shirazi, an adventurer in a Conan-like and ancient Persia-like world. In the preview issue, the stories do not connect in any way, though I’m sure there’s something more to be seen. Further issues are available in digital or print version. Check out the Persia Blues website for details. Brett does some very interesting artwork in this comic, because the two settings of the story are drawn in very different styles. The ancient Persia story is in a painterly black and white and grey reminiscent of the old Savage Sword of Conan magazine. The modern setting is done with simple black line work. Brent is very strong with emotional scenes and character expression. And expression is very important, as the story covers a lot of feelings people in modern Iran have about the social and political climate in the country. Dara also tends to write plenty of words in each panel, which is something I particularly like. It makes silent, or almost silent, panels have more impact and helps the pacing of the story a lot. I wish more modern comic writers would understand that, while they don’t need to be overly wordy, they need enough words to make the characters’ personalities apparent. Iran is, of course, not the favorite location of most Americans. Though I wonder how many truly understand, or even try to understand, the people of the region. It’s easy to hate a country whose leaders constantly declare war on us without a thought as to what the citizens of the country do and think. Personally, I remember the first time I ever heard of Iran, when I was in 5th grade, was when during the hostage crisis. That’s not a very good beginning memory. However, I also remember people telling me that a nuclear war with the USSR was inevitable in my lifetime. Things can change. Dara, by the way, was born in Iran and educated in the United States. He’s done work for many comic companies such as DC, Dark Horse, and IDW. So there’s a lot of work of his out there. I’d invite everyone to check some of his stuff out! Start with Persia Blues!